Last night, The Quilliad participated in a Halloween poetry circle at the Smiling Buddha bar on College Street in Toronto. We had three feature readers–Christian Quaresma, Phlip Arima, and Mike Lipsius–and a few other poets who joined in as well. We also had a merch/art display table for people to peruse before and after the readings, which ranged from contemporary lyric poems to dark twists on childhood story-telling techniques. Christian Quaresma reading a poem that mentions Neil Gaiman. Phlip Arima reading from one of his books. Reading from one of my chapbooks. Devin sharing a piece from his notebook. Mike Lipsius reading from his book, Lessons in Gravity. Phlip Arima reading (or rather, acting out) a silly but clever piece. We may be doing more of these. 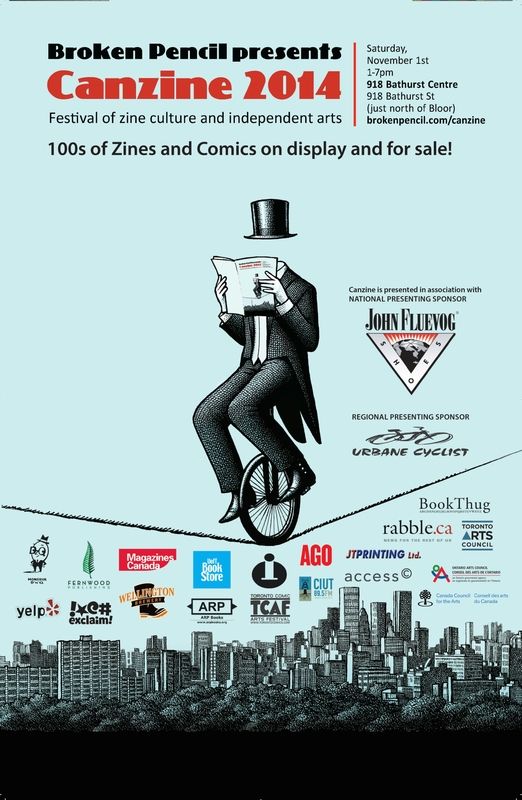 The Quilliad will also be at Canzine on Saturday (November 1) from 1-7pm at 918 Bathurst in Toronto. Canzine is a “festival of zine culture and independent arts” that occurs in three cities across Canada in October or November each year. The festival originated in Toronto in 1995 and is still going strong. Check out our Halloween Launch/Costume Party Photos! It’s possible that our fourth issue launch party was our best yet. People really got into the Halloween spirit, and the costumes were fantastic. We also had a great turnout and a lot of interest in other work by our contributors (who were selling their own art prints and books). We had some great readings by some of our contributing writers and a beautiful art display. We look forward to showing off the fourth issue at Canzine next Saturday. If you’re in Toronto, be sure to stop by. 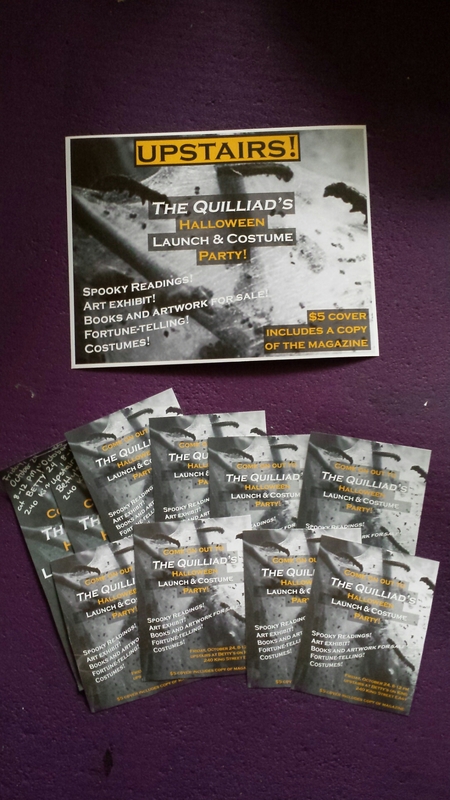 The Quilliad’s Halloween Launch and Costume Party is tonight! We’re all set for our launch party tonight, so if you’re in Toronto, grab a costume and head on over! We at The Quilliad put our finishing touches on our costumes last night and can’t wait to show them off. If you can’t make it, we’ll be sure to post photos of everyone’s spooky looks. Like the poster says, our launch/costume party will be from 8-12 PM on Friday, October 24 at Betty’s on King (240 King Street EAST, Toronto), upstairs in the party room. There will be books and art on display and for sale, creepy readings by our contributors, and a fortune teller during the breaks. I’m looking forward to everyone’s costumes–mine includes a long white dress and a lot of fake blood! The Quilliad’s fourth issue Halloween-themed launch party is less than a week away, and we’re pretty excited about the amazing writers and artists we’ll be featuring in this issue (many of whom will be present at the launch with their art/to read their work). One of those artists is Melissa Crook, a Toronto-based artist with a background in design whose work draws out the beauty in the unconventional and tints beauty with a hint of darkness. 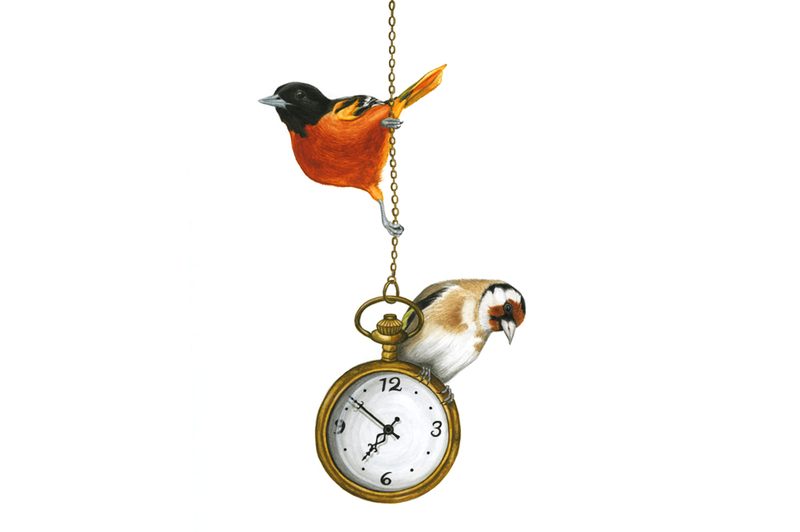 Melissa is another fantastic artist who I discovered through Toronto Indie Arts Market. She draws inspiration from classic literature (see: “The Fox of the Baskervilles”), the gothic novel, and folk tales. 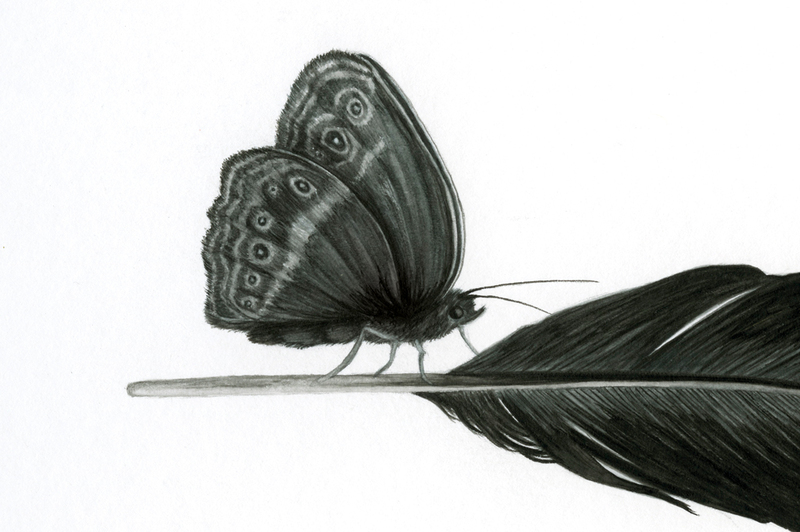 Her elegant and slightly eerie images of birds, mammals, insects, and plants often float against white backgrounds, making her delicate line work and rich colour palette stand out. Melissa learned the basics of drawing from her mother and has evolved into a sophisticated watercolour painter. Some of her originals are available on her website, as are prints of her work. 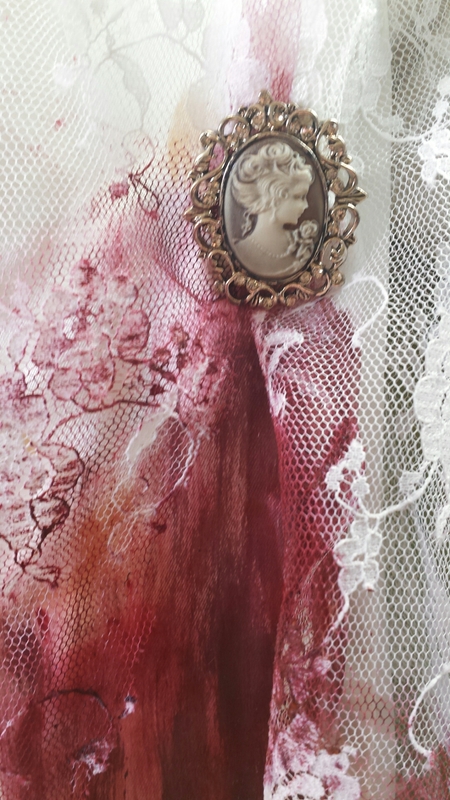 She also makes jewelry featuring her pieces, so that people can carry her work “Victorian style” in “little vessels”. The results are as charming as her description suggests. Melissa may have some of her work with her at the launch (this Friday at Betty’s on King from 8-12), but you can also check her out in depth at http://mcrook.ca. She also has a Facebook page. Our Halloween Launch Party Now Has a Fortune Teller! Amanda Boulos, an artist whose work we published in our third issue, will be lending us her fortune-telling skills for our fourth issue launch and Halloween party. The launch will be from 8-12 p.m. on Friday, October 24 at Betty’s on King (240 King Street East, upstairs party room). Costumes are encouraged, so find your fangs and join us for spooky readings, an art exhibition, and fortune-telling! “I remember my parents going to a women’s home and sharing a cup of Turkish coffee with her. When they finished discussing politics, their economic struggles and the family, they would sit around their empty cups exchanging readings using the micro grains left on the bottom of their cup. As I grew older the tradition died, and I was only a generation too late to get my fortune read by the women. As a young adult searching for my place in the world I’m curious about what she would have told me. Our launch/costume party for our fourth issue (October 24 from 8-12 at Betty’s on King in Toronto) won’t be the only place you can find us this fall. For the first time ever, The Quilliad will be at Canzine Toronto. This Toronto zine fair has been running since 1995 and shows no signs of stopping. Run by Broken Pencil (who reviewed us earlier this year), the event includes 200 tables filled with zines, comics, and small press books; a panel on zines and politics; two competitions; and a reading series. The Quilliad will be there with copies of issues 1-4 and chapbooks by staff and contributors. Our launch/costume party for our fourth issue (October 24 from 8-12 at Betty’s on King inToronto) won’t be the only place you can find us this fall. For the first time ever, The Quilliad will be at Canzine Toronto. 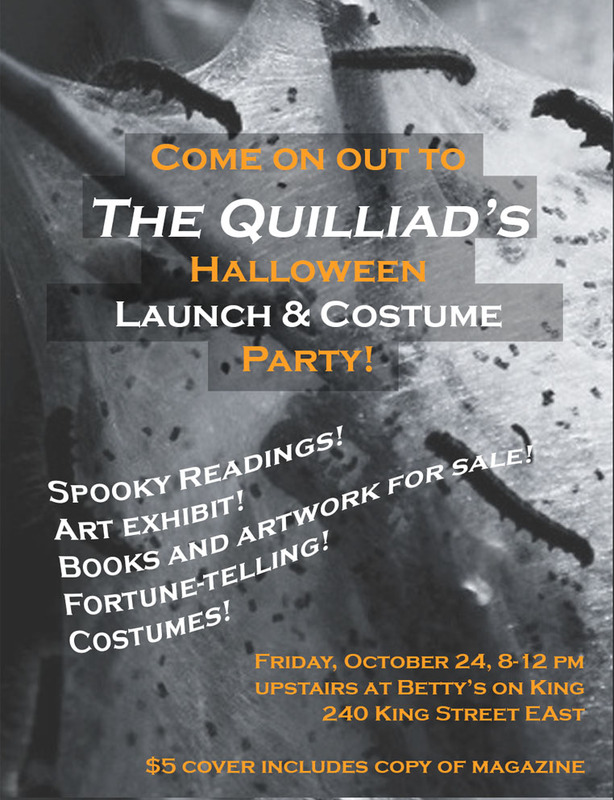 The Quilliad‘s fourth issue is almost ready to be printed, and we’ll be celebrating with a Halloween-themed launch party complete with costumes at Betty’s on King (240 King Street East, 2nd floor party room) in Toronto on Friday, October 24, 2014 from 8-12 p.m. We’ve created a Facebook event and will be posting updates here on our website as well. We’ll have readings of spooky poetry, flash horror, and science fiction stories, and will be exhibiting dark art by current and past contributors. Grab a costume and come party with us! We’re excited to announce that The Quilliad’s Kickstarter was a success! We raised $675, $25 over our goal. Thank you to everyone who contributed–we’ll be working on putting the publication together over the next couple of weeks and on getting the rewards ready for our backers. We’ll be making our decisions about all the great poetry, short story, and art submissions we received soon, so submitters can expect a response by mid-October. We look forward to sharing issue 4.